Kiso Valley is surrounded by the mountains at a level of 3,000 meters in the northern side of Mount Ontake and in the southern side of Mount Kisokoma. It is a real hidden place. Soothe away the daily fatigue in the hidden hot spring at the hidden place. Try various types of hot springs including relaxing carbonated springs and ferruginous springs. The natural hot spring, which is easy to use, is located 5-minute drive from the city of Kisofukushima to Kaida Plateau. Kiso is a historical station town enveloped by the great nature – murmuring of the Kurokawa River, magnificent mountains and relaxed atmosphere. Escape from everyday life and freshen yourself by spending luxurious time at natural hot spring with historic ambience of Kiso Road. Brownish-red natural soda hot spring. At the base of the Jizo Pass (on the way from Kiso Fukushima to Kaida Kogen highland), you will find Nihongi-no-yu hot spring. It has been a popular place for the travelers, religious followers from the old days. Not only locals but also people from other prefectures visit repeatedly. Ontake Onsen Otaki no Yu is a little-known hot spring down the long gravel road from the center of Otaki Village. The environment surrounding Otaki no yu is noting but great nature. Take time for yourself and going for a trip to hot springs! Ontake Kougen Onsen - Komorebi no Yu uses water flowing directly from the hot spring source. Spring type is sodium and calcium bicarbonate spring. This hot spring facility is located near the camping site within Ontake Kyukamura (vacation village). 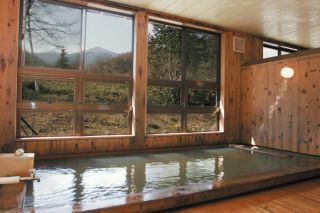 Have a long soak in the hot spring while watching the light filtering through the trees. Please relax in the medical spring where the sunshine comes through leaves in the forest. The spring is mineral-rich iron carbonated water. At the same elevation as Mt. Ontake 2nd station, you will find a natural hot spring. The water flows directly from the hot spring source. Located very close to the grand mountain, Mt. Ontake. The water is originally clear, but when the iron reacts to air, it changes to brownish-red color. Come and get warm in the natural hot spring.